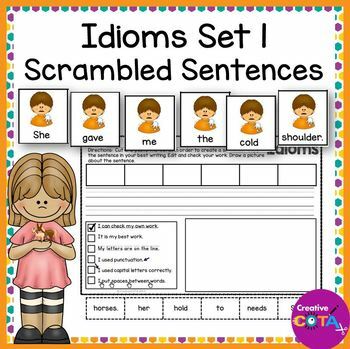 This is an idiom writing resource with scrambled sentence cards and no prep, cut and paste sentence building worksheets. People say the funniest things. Can your students figure out what they mean. 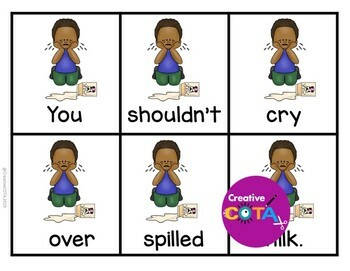 Great for writing centers, special education, small groups and OT sessions. Use these sentence cards, with coordinating pictures, for students to build a sentence then read, write and/or type the sentences. I use these with my special education students who need to work on handwriting and/or keyboarding from a model. Six different, 6 word sentences are included. 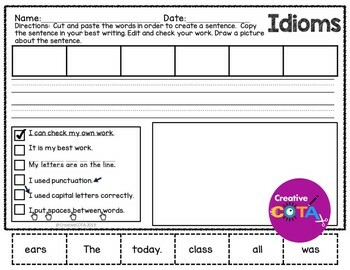 Also included are 6 BW, cut and paste build and write a sentence worksheets. A bonus blank cut and paste page is included for you to create your own sentences. You decide which sentences to have your students build, read, write and/or type. Full sentence picture sheets can also be used as models for the cut and paste pages. Directions: Copy, cut out and laminate cards for multiple use. Have students sort the cards by picture then put them in order to read, write and/or type the sentences. You can use a full copy of the page for students who may need a model to make the sentences. Print the no prep worksheets for students.